As a firefighter you'll respond to emergency situations and protect people, the environment and property from all types of accident and emergencies. You'll work closely with the local community to increase their level of fire safety awareness, in order to help prevent fires and accidents happening in the first place. Promoting fire safety and enforcing fire safety standards in public and commercial premises, you'll act and advise on all matters relating to the protection of life and property from fire and other risks. In the role you'll continually learn and update your knowledge through a series of lectures, exercises, practice drills and training, which are an integral and on-going part of the job. wholetime firefighters - work for the fire service full time and usually cover urban areas. retained firefighters - are on-call responders who usually cover rural areas. You'll typically live or work within five minutes or one mile of the fire station and respond to pagers when an emergency call is received. You'll either be self-employed or work for an employer willing to allow you to leave work immediately to attend an emergency. maintaining links with the local community. dealing with political aspects of the Fire and Rescue Authority (FRA). The starting salary for a trainee firefighter is £22,459. When full competence is achieved, this rises to £29,934. Higher rates apply for overtime. Crew manager salaries range from £31,816 (development) to £33,934 (competent). Watch manager salaries range from £33,905 to £37,112. A station manager's earning potential is between £38,602 and £42,576 plus overtime rates, subject to the officer's level of competence. Further advancement to the role of group manager and then area manager attracts salaries of between £44,458 and £57,252, depending on the level of competence. Retained firefighters are paid an annual retainer, dependent on their role in the service, plus a turn-out fee for each incident they attend. 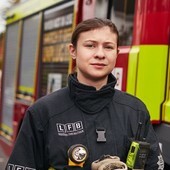 Retainers start at £2,246 for a trainee, while a competent retained firefighter receives £2,993. London firefighters are paid more. Income data from the Fire Brigades Union. Figures are intended as a guide only. Hours of work typically include regular unsocial hours. You'll usually work 42 hours a week in a shift pattern. Most firefighters work two day shifts followed by two night shifts, before having four days off. However, different services employ different duty systems, depending on their needs. When necessary, paid overtime is worked. Job-sharing and part-time work are possible. The work often takes place in dangerous and unpleasant conditions, for example in heat and cold, at heights, in enclosed spaces, smoke-filled buildings and all kinds of weather conditions. You may be exposed to danger from collapsing buildings or vehicles, explosions and fumes. You need to be physically fit, as firefighters carry heavy equipment and breathing apparatus. Although self-employment and freelance work may be possible, it's more likely after retirement in areas such as consultancy or training. Women are currently underrepresented in the profession. However, the fire service is working to recruit more female, black and ethnic minority firefighters through positive recruitment strategies. Smart appearance is important. Firefighters wearing breathing apparatus are required to be clean shaven to ensure the equipment can work effectively. Travel within a working day is frequent. Absence from home overnight (other than rostered duty) and overseas work or travel are generally uncommon. Personal qualities and physical attributes are more important than academic qualifications, though a good general education is required. A degree or other further education qualifications are not essential and entry without a degree or HND is common. BSc (Hons) Fire and Rescue at the University of Wolverhampton - in partnership with West Midlands Fire and Rescue Service. These courses don't guarantee entry into the fire and rescue service but aim to equip students with the skills needed to pursue a career in the fire industry. For more details see Universities and Colleges Admissions Service (UCAS). Other related degree courses in areas including fire engineering, fire safety and risk management or fire and explosion are also available. Search for postgraduate courses in fire safety engineering for more options. You need to be aged 18 or over to become a firefighter. After successful completion of an application form, you'll go through the standard national selection process called the National Firefighter Selection (NFS), as well as a Personal Qualities and Attributes (PQA) test to ensure you're suitable for the role. Applicants then move on to physical tests carried out in full firefighter uniform before attending an interview, and towards the end of the selection process you'll be invited to attend a medical. Good vision in both eyes and good hearing are essential. For more information on the NFS process see Fire Service. To improve your chances of entry, you need to keep fit and gain as much information as possible about both the role and the fire and rescue service in general. To keep up to date with relevant fire issues, join the UK Fire Service Forum. an interest in promoting community safety, education and risk prevention. You may also need a full UK driving licence. Due to health and safety requirements work experience isn't possible, although you may be able to be placed as an observer in a fire station or attend an open day. Contact the fire and rescue service you're interested in to enquire. Depending on your circumstances, you may be able to work as a volunteer or retained firefighter. Experience of this nature could increase your chances of gaining a full-time position. Fire and rescue services only recruit when they need firefighters to replace those who are retiring or leaving the service, and competition can be fierce. Each fire service recruits independently so contact services directly. The current economic climate and public sector cuts may affect the number of jobs available. In England, there are 46 fire and rescue services run by fire and rescue authorities (FRA). For a list of services by region, see the National Fire Chiefs Council (NFCC). The Scottish Fire and Rescue Service (SFRS) is responsible for the whole of Scotland, while Northern Ireland is divided into four area commands and is overseen by the Northern Ireland Fire & Rescue Service (NIFRS). Fire Service - offers a firefighter recruitment text service for a fee. myjobscotland - register for alerts for SFRS vacancies. Initial firefighter training takes an intensive 12 and 18 weeks to complete. It's usually held at a specially-equipped training centre where you will be taught basic firefighting skills such as ladder safety, hose laying and how to use breathing apparatus. Training also involves learning about fire safety and the importance of getting the fire safety message across within the local community. You'll be required to undertake regular study, both in the training centre and out of hours, and your progress will be regularly assessed. Once you've attained your first aid certificate and got to grips with the basic skills, you'll get to experience a simulated fire. On successful completion of the initial training, you'll join a fire station on probation and your performance will be continuously assessed. This development programme typically takes around two years and focuses on learning about the community and the risks surrounding your station, and showing competence in the areas covered at the training centre. Visit individual fire and rescue service websites for details of their training programme. You'll be expected to undertake a CPD programme throughout your career, which includes attending lectures, exercises, practical training sessions and other forms of training to maintain your competence levels. You'll be responsible for developing your own skills and maintaining fitness. Relevant courses are also run by the Northern Ireland Fire and Rescue Training Centre. Promotion is earned on individual merit subject to demonstrating competence in each role and showing evidence of potential through attendance at assessment and development centres. Crew manager - responsible for the fire appliance and crew, takes charge of smaller incidents and provides support to the watch manager. Watch manager - leads a number of smaller teams at larger incidents and may have duties as a fire safety inspector. Station manager - ensures the service's delivery at one or more fire stations and may take charge of larger incidents. Group manager - responsible for the service across a geographical area (e.g. London) or a specialist department, such as training. Area manager - responsible for a larger geographical area or for heading a directorate. Brigade manager - strategically responsible for departments and supports the chief fire officer. Chief fire officer - responsible for ensuring effective delivery of all fire and rescue service duties. Beyond the level of station manager, it's often necessary to move between services to get promoted. Other possible opportunities include study for membership of the Institution of Fire Engineers (IFE) for those involved in fire safety and prevention work, or study for a general postgraduate management qualification.